Walt Disney’s 1951 documentary Nature’s Half Acre was unusually successful for having such a simple premise: that there is an amazing spectrum of nature to be found on even a relatively small piece of open property. In fact, the movie’s cast was both huge and small — hundreds of little insects, various birds, spiders and lizards, flowers and other plants galore. Likewise, the theme of this exhibit is the abundance of plants and animals I’ve managed to photograph from the two acres around my cabin overlooking Point Reyes Station. Fortunately, the small town (population 820) remains a bit of the Old West despite being only 40 miles north of San Francisco. How much longer the town’s historic charm will last has, however, been uncertain ever since the opening of the Point Reyes National Seashore in 1965. Often now on weekends, the town is overrun with tourists (almost two million per year) en route to the nearby park. The tread of that many visitors on the flora and fauna of this area is crushing in more ways than can be easily imagined. Here, therefore, are some glimpses at what still survives. 1. Male Western fence lizards do pushups to intimidate rivals, exposing their blue bellies in the process. When under attack, the tip of their tail twitches to draw the predator’s attention away from the body of the lizard. While the lizard can survive the loss of the tip, the loss takes a toll on the lizard which stores food there. 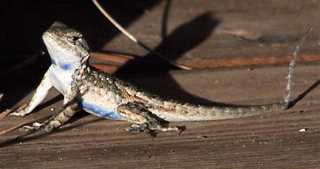 The Western fence lizard is pestered by ticks, but when ticks that carry the Lyme Disease spirochete bite a “blue belly,” the spirochete dies. 2. 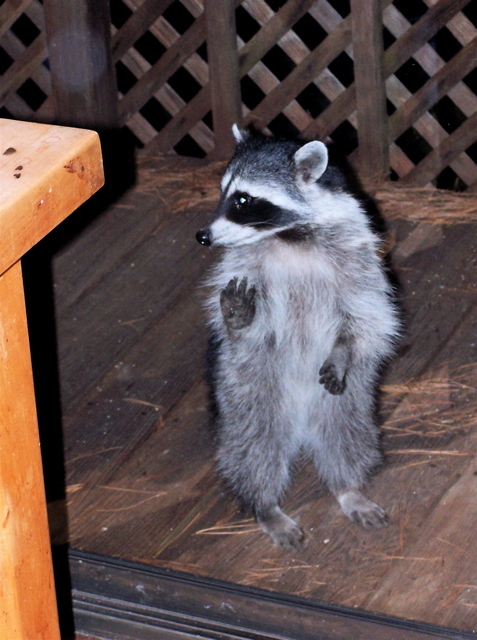 A raccoon showed up at my kitchen door at Halloween and stood up with a paw on the glass to catch my attention. The young raccoon was obviously used to begging from humans, and given the occasion, I rewarded it with a Halloween cracker. 3. Sunset looking southwest from the deck of my cabin. In the middleground, the setting sun casts a glint off a shiny leaf. 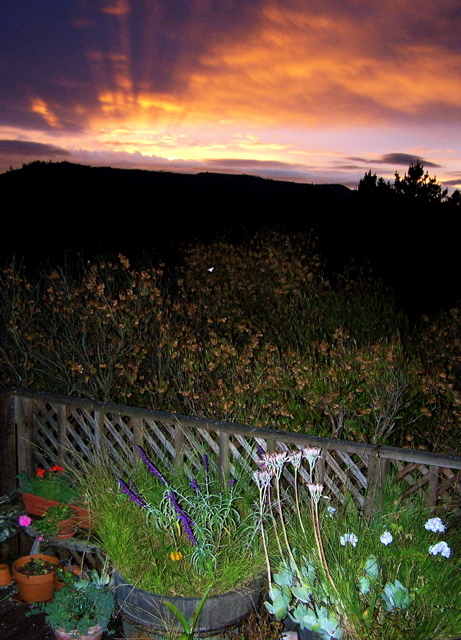 In the background is Inverness Ridge, much of which is in the Point Reyes National Seashore. 4. 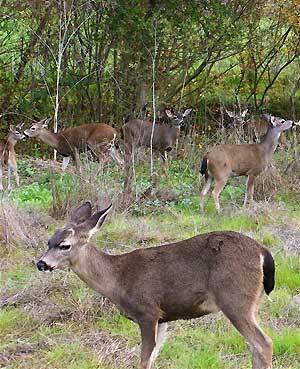 I have blacktail deer on my property throughout the year. 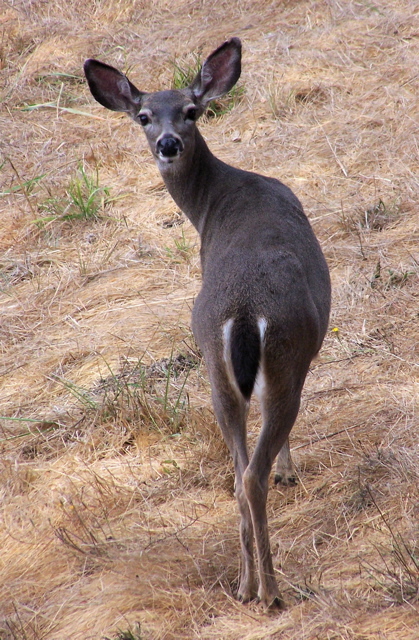 I photographed this doe through my dining room window. At some times of the year, as many as 14 blacktails can be found around my cabin at one time. 5. Red foxes are far less common than gray foxes in West Marin; however, they are common in the Sierra, Cascade Mountains, and Central Valley, and there have been red foxes on Point Reyes for many decades. 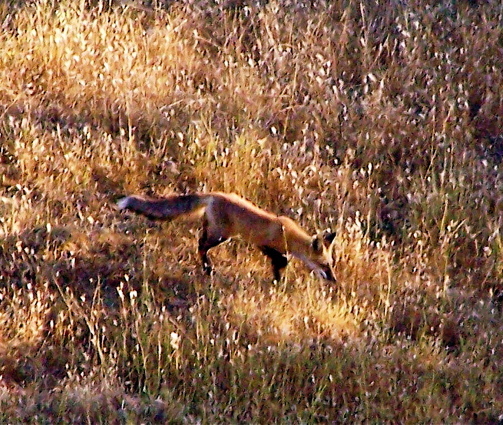 Some may be the descendants of foxes that escaped fox hunts in Nicasio during the 1970s. 6. 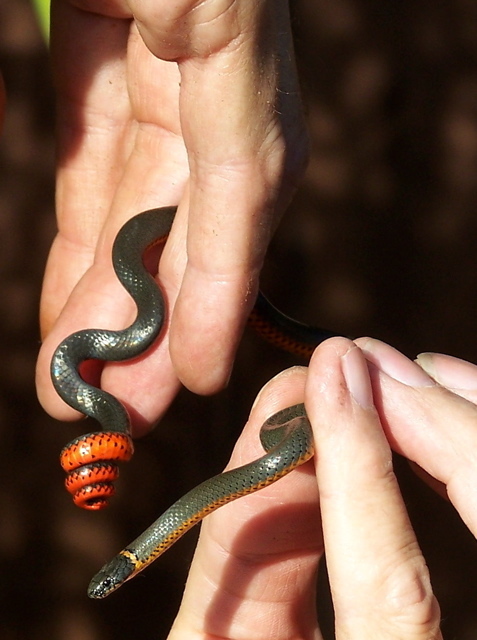 I found this Pacific Ring-necked snake in a rotten log while splitting firewood. The snake eats very small critters — tadpoles, insects, and especially salamanders — and it has just enough venom to immobilize them. However, the snake is not dangerous to humans. The new owner of The Point Reyes Light has fabricated so much in court papers and public statements that I feel compelled to respond. Related topics included here: Robert Israel Plotkin found to be frequently filing lawsuits. Robert Plotkin and mother defendants in US bankruptcy court in connection with a $77 million Ponzi scheme. Plotkin’s attorney Robert H. Powsner, 77, blames his own “forgetfulness” as he attempts to explain away a “web of lies” in his court filings. Here are the facts regarding the litigation filed by The Point Reyes Light’s new owner Robert Israel Plotkin against me, the former owner, against Joel Hack, owner of The Bodega Bay Navigator website, and against other people. Some of what is here was discovered by people not connected to the case. 1. The most-significant misconception about problems at The Point Reyes Light is that they center on disputes between new publisher Robert Plotkin and me. They don’t. In the first 12 months after he became publisher, 13 staff and contributors were fired, quit, or in various ways shown the door. Some staff such as Gayanne Enquist of Inverness, Sandy Duveen of Woodacre, Jim Kravets of Fairfax, and Peter Jamison, formerly of Woodacre, did not have jobs lined up when they left. I, at least, am retired. 2. Prior to Robert Plotkin’s and my falling out last February, I had been working diligently to help the paper during its transition to new ownership — as a consultant to the newsroom, a columnist, and a photographer. I have a five-year employment contact with The Light, which cannot be unilaterally terminated, but it pays only $175 per week to be available as a consultant. Nonetheless, I volunteered additional help as needed. Following the New Year’s Eve storm, I spent three days slogging through mud and wading through water to photograph the damage. However, as numerous people who have dealt with the new owner have discovered, he is frequently insulting and abrasive, and when he insulted me, we got into a shouting match in front of The Light. Plotkin initially told bystanders and a sheriff’s deputy he was a victim of “attempted murder” — that I had tried to strangle him. However, hairdresser Barbara Keady, a witness who spoke with Plotkin immediately afterward, and sheriff’s deputy Ted Keehn both noted there were no marks on him. “Plotkin had no visible injuries,” deputy Keehn wrote in his incident report. Plotkin then added to his story that I had tried to run him down with my car after he and I started yelling at each other. But when deputy Keehn interviewed witnesses, that story didn’t hold up either. Realtor Robert Cardwell told the sheriff’s deputy that he saw Plotkin and me arguing in front of Greenbridge Gas & Auto. When Plotkin got out of my car, I made an abrupt U-turn on Mesa Road and stopped in front of The Light with a wheel on the sidewalk, which is flush with the pavement (i.e. there is no curb). “Mitchell got out of the red Acura and ran toward Plotkin,” deputy Keehn quotes the Realtor as saying. The deputy quoted hairdresser Barbara Keady as saying “she saw Mitchell park his vehicle in front of The Point Reyes Light on the sidewalk. Mitchell got out of his vehicle and had a heated verbal argument with Plotkin.” Sandy Duveen, who then sold advertising for The Light, told the deputy that after the Acura stopped abruptly in front of The Light, “she saw Mitchell walk towards Plotkin,” the officer reported. So there was no attempt to strangle Plotkin or hit him with my car. As for my parking with one wheel on the sidewalk, anyone familiar Point Reyes Station’s old Creamery Building, where The Light is located, has often seen cars with at least one wheel on the sidewalk. Here, for example, is Plotkin’s own car parked mostly on the sidewalk. 3. Represented by Point Reyes Station attorney Robert Powsner, Plotkin then asked for a restraining order and later an injunction that prohibits me from being around him, his family, and his newspaper. Like other staff and contributors who have left, I had by then concluded Plotkin was immature and abrasive, as well as sometimes dishonest, so I had no problem agreeing to stay away from him. When asking Marin Superior Court to issue a retraining order against me (because we had shouted at each other), Plotkin claimed he needed special protection because of my supposedly immense size. With his irrepressible flair for the dramatic, Plotkin told the court I am 6-foot, 6-inches tall and weigh 225 pounds. Now Plotkin, of course, was writing from the perspective of a short and pudgy (The Marin Independent Journal called him “pear-shaped”) 36 year old. Nonetheless, this 63-year-old retired editor is definitely not larger than pro football’s Terrell Owens, the big wide receiver. In reality, I am 45 pounds lighter and three inches shorter than what Plotlin cavalierly wrote in his sworn statement. In the last five years, the former lawyer has filed lawsuits against six tenants, one against The Bodega Bay Navigator website and its owner Joel Hack, and two against me. He is also a defendant in US bankruptcy court. Although for a while he was a deputy district attorney in Monterey County, Plotkin is no longer licensed to practice law in California. 4. Long before Plotkin and I had our squabble, he had a falling out with The Light’s long-time cartoonist, Kathryn LeMieux of Tomales, who quit contributing. 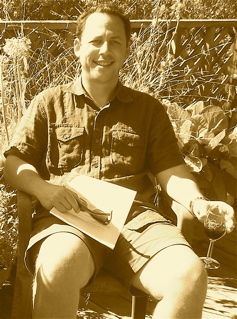 The Bodega Bay Navigator in Sonoma County had just converted from a weekly newspaper to a website, and owner Joel Hack invited LeMieux to post her cartoons on The Navigator site. After I agreed to Plotkin’s injunction, which forbids my even sending him email, Hack invited me to also start posting on his website, which I did. In an Aug. 14 lawsuit filed by Plotkin against Hack and me, he claims I “induced” LeMieux “to become the cartoonist for The Navigator.” (My supposedly recruiting LeMieux, Plotkin suggested, amounted to my unfairly helping a competitor.) But like other things Plotkin has said in his lawsuits, in The Light and to other reporters, this was a total fabrication. LeMieux had agreed to draw for the website before I was involved with it. 5. Attorney Robert Powsner on Plotkin’s behalf then got Judge Jack Sutro to issue a bizarre injunction against my posting on the Bodega Bay website. Plotkin and Powsner had told Judge Sutro that by letting me post writing and photos on The Navigator’s site, Hack was “damaging or destroying” The Light. The judge agreed, and in chambers he told lawyers for both sides that protecting Plotkin’s $500,000 investment in The Light outweighed constitutional prohibitions against censoring free expression. In addition to making no distinction between a website and a newspaper, Judge Sutro even more bizarrely failed to distinguish between a business being based in Marin County and a business being based in Sonoma County, where The Bodega Bay Navigator has always been located. The judge apparently accepted Plotkin’s boggling claim that the place of publication depends on what is written about in newspapers and websites, as well as in which communities they can be read. Perhaps contributing to Judge Sutro’s confusion, Powsner and Plotkin untruthfully told Judge Sutro last August that The Navigator website “has no publishing or production facilities or premises in Sonoma County other than defendant Hack’s computer.” Exposing this fabrication, The Marin Independent Journal subsequently published a photograph of Hack working in The Navigator’s cluttered “shack,” a building located behind Hack’s Bodega Bay home. 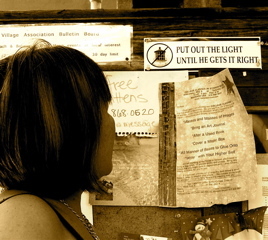 Because Plotkin — in securing an injunction against The Bodega Bay Navigator and me — claimed that competition from The Navigator’s site is “damaging or destroying” The Light, Navigator owner Joel Hack and I as co-defendants are now assembling evidence such as this to demonstrate it is Plotkin himself who is “damaging or destroying” The Light. The injunction is now being appealed, and more litigation is expected. Under Plotkin’s ownership, many readers have complained about Light reporting that is inaccurate, sensationalistic, or inappropriate for a community newspaper. Subscriptions have been dropping, as Plotkin admitted in his Nov. 9 issue. This sign was spotted on the Stinson Beach Village Association bulletin board opposite the front door to the town post office. As co-defendants having to ward off Plotkin, Hack and I would welcome submissions of any legally significant evidence showing that whatever wounds The Light has suffered have been self-inflicted rather than caused by competition from The Navigator website: http://www.bodegabaynavigator.info/interiorpages/WMarinNews/WMarinNews.htm. 6. I am getting excellent legal representation from attorney Ladd Bedford and Arman Javid of the San Francisco law firm McQuaid, Bedford, and VanZandt, and we will appeal Judge Sutro’s injunction, now that he has finally signed it. In addition, retired attorney Judy Teichman of Inverness Park is working as a volunteer on my behalf. 7. In the meantime, some fascinating West Marin stories are being left uncovered. How in the world, for example, did “defendant Robert Israel Plotkin” end up in federal bankruptcy court this fall in connection with a $77 million Ponzi scheme? The case was investigated by the FBI and prosecuted by the US Attorney’s Office. The ringleaders, Moshe Leichner and Zvi Leichner, are now serving time in prison, a US bankruptcy trustee is trying — so far without success — to get at money the Leichners squirreled away in one Swiss and two Israeli bank accounts, and the Justice Department has warned the ringleaders they may be deported. A federal hearing was held in October, with attorney Powsner representing “defendant Robert Israel Plotkin,” according to court papers. Plotkin’s mother Zaporah Bank of Los Angeles, another defendant, is representing herself. So the question we are left with is: how much did Robert Plotkin know and when did he know it? It may merely be that in contriving to make an unbelievably high “guaranteed” profit in the high-risk, foreign-currency-exchange market, Plotkin got involved with shady characters. However, he can hardly claim to be financially naïve since he is enough of an investor to own or have recently owned — besides The Light —an $840,000 seaside home in Bolinas, another house in Taos, New Mexico, real estate in New York City, and rental homes in San Diego County. I have no idea how much of this he presently owns or whether he will even stick around West Marin too much longer. 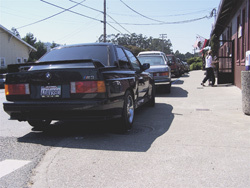 Although he has by now owned a home in Bolinas for two years, the BMW he drives to work still carries New Mexico license plates. As for the real estate in San Diego, Robert Plotkin went into that county’s superior court six times in five years, seeking to have tenants evicted. If you add to those six lawsuits the two Plotkin filed against me this year and the one he filed against Joel Hack, owner of The Bodega Bay Navigator website, you get a sense of just how litigious this former lawyer is. 8. Another curious story not receiving coverage is the role of Point Reyes Station lawyer Robert H. Powsner, who is representing Plotkin against Bodega Bay Navigator owner Joel Hack, the federal bankruptcy trustee, and me. As it happens, Powsner’s law firm is one of three I had been using, depending on the nature of the issues. My current attorney, Ladd Bedford, who has been a friend since our days together at Stanford, gave my former wife Cathy and me free day-to-day advice during The Light’s Synanon investigation. The Heller Ehrman White & McAuliffe law firm — likewise at no charge — successfully fought off six lawsuits totaling $1.032 billion, which lawyers for the Synanon cult filed against the two of us. One case went all the way to the California Supreme Court, where Heller Ehrman won a major legal precedent that greatly increased California reporters’ right to keep confidential sources confidential in civil cases. In addition, I had hired attorney Powsner to represent me in a variety of matters, including one out-of-court dispute involving my firing of an intern when he failed to cover a major storm, as assigned. After firing him, I had to stop the intern from running off with the office keys. What I didn’t know until a witness’ sworn statement this year was that the intern had been ripped on cocaine at the time. When I hired Bedford and not Powsner to draft the sales agreement for The Light, Powsner went ballistic — perhaps because he owed The Light about $4,000 at the time and would have liked to work off the debt. In any case, when I approached him for help in dealing with Plotkin, Pownser announced he was switching clients and intended to represent Plotkin against me. Under the California State Bar’s Code of Ethics, Powsner should have refused to fight a former client in court since he has confidential information about that client. The reason for the rule became immediately obvious; Powsner (before finding out that cocaine was the likely cause of the intern’s behavior) repeatedly tried to dig up more information about that dispute to use against me on Plotkin’s behalf. My attorneys have asked a court commissioner to disqualify attorney Powsner because he had previously represented me. In particular, he had attempted to use information from the intern dispute, against me on behalf of a new client. Powsner, who is 77, responded with a surprising rationalization for his investigating on behalf of Plotkin an out-of-court dispute that he negotiated as my lawyer: it was simply a matter of his “forgetfulness.” That would be an amazing admission for any lawyer to make — and especially one who is still practicing in his seventy-eighth year and would like to continue. Powsner apparently also forgot that in the months before the motion to disqualify him was filed, he had talked over the matter with my lawyer and one of my lawyer’s partners, Arman Javid, as well as The Light’s former business manager Don Schinske, The Light’s former typesetter Cat Cowles, The Light’s present front-office manager Missy Patterson, and (as he himself would later acknowledge) his own secretary Susan Cofano and his new client Robert Plotkin. Attorney Powsner now has his own attorney, Peter Flaxman of Mill Valley, to help untangle him from his “web of lies.” In the meantime, a complaint has been sent to the State Bar regarding forgetful Bob’s unethical conduct. Update: Ultimately, I countersued Plotkin, and in January 2008, he and I announced we had settled the litigation between us. I was pleased with the financial and non-financial aspects of the settlement, but we agreed to keep the details confidential. So you managed to find your way down here. Come on in. Welcome to my digs. Keeping a log on the web (i.e. a blog) is a bit like keeping a log on a ship. It includes both a journal of one’s trip through life and reports on significant events along the way. If Barger is right, however, blogging is unique among all the forms of storytelling. When most of us encounter something interesting, we can’t wait to tell others about it. And that’s what this blog will mostly consist of: stories, comments, and photography that reflect my life and interests as a resident of Point Reyes Station. The purpose of this site is not to be an alternative to The Point Reyes Light, which I formerly owned, although it will periodically comment on the newspaper and, when need be, set the record straight. But basically I’m more interested in events such as occurred Tuesday morning, Nov. 21, in Chileno Valley. As it happened, I was called upon to be a liaison between six orphaned fawns and two ranchers. The trick was getting the fawns from Olema to Chileno Valley. 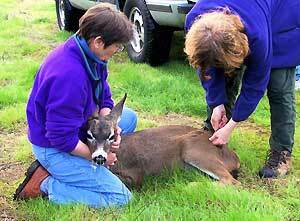 Early that Tuesday, Susan and another WildCare volunteer, Cindy Dicke also of Olema, gave the fawns injections to sedate them. 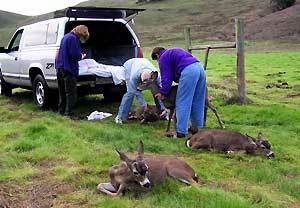 Mike Vincilione of Point Reyes Station arrived in a pickup truck with camper shell, and the sleeping deer were loaded onto mats and towels in the truckbed. The drive to Chileno Valley took about 40 minutes, with Cindy riding among the deer. The release itself went amazingly smoothly. Mike drove across a ranch bridge to a pasture bordered by a creek, and there each fawn was lifted gently out of the truck and laid on the grass. Cindy then gave them all wake-up shots, and the fawns quickly revived. Some were wobbly enough when they first tried to stand that they had to be steadied lest they fall and injure themselves, but this lasted only for a minute or two. The fawns have now been on the ranch a week and appear to feel at home — to the point where the domineering buck tried to mount one of the ranchers. “When that happens,” Susan told her, “just slap him.” The other fawns are more leery of humans, and after a few more slaps, the lecherous buck probably will be too. Sparsely Sage and Timely is powered by	WordPress 4.9.10 and delivered to you in 0.367 seconds using 42 queries.